Milford - HEDRICK SMITH discusses his book on the American Dream. We are honored to host the Pulitzer Prize winning journalist HEDRICK SMITH to our store as he criss-crosses the Granite State, where he will give a short presentation on his latest book, Who Stole the American Dream? In this magnificent work of history and reportage, the Mr. Smith provides an eye-opening account of how, over the past four decades, a series of seismic changes dismantled the American Dream. 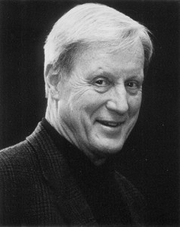 HEDRICK SMITH is a bestselling author, Pulitzer Prize winning reporter, and Emmy winning producer. His books The Russians, and The Power Game were critically acclaimed and widely used in college courses today. Smith's prime-time specials for PBS have won several awards for examining systemic problems in modern America and offers insightful, prescriptive solutions. With help from the Harvard Kennedy School New Hampshire Network, Gibson's Bookstore is pleased to welcome Hedrick Smith, the Pulitzer Prize winner, the "New York Times"-bestselling author and PBS "Frontline" reporter, as he presents his remarkable, step-by-step story of how the American Dream was dismantled over the past 40 years by a series of landmark legislative, electoral, and corporate decisions. Last fall, Village Books hosted Pulitzer Prize-winner Hedrick Smith for his book, Who Stole the American Dream? to a standing-room only crowd. Hedrick will be returning to Bellingham to talk more about his book at Bellingham City Club. Smith's new book is an extraordinary achievement, an eye-opening account of how, over the past four decades, we have become two Americas. He takes us inside America to show the hidden, long-term process of landmark legislative, electoral and corporate decisions that have transformed us from an era of middle class power and prosperity and effective bipartisan politics to a new era of partisan gridlock, unequal democracy and even more unequal economics that have unraveled the American Dream for millions of middle class families. Hedrick Smith, Pulitzer Prize-winning former New York Times reporter and editor and Emmy award-winning producer/correspondent, has established himself over the past 50 years of his career as one of America's most distinguished journalists. In 26 years with The New York Times, Smith covered Martin Luther King, Jr. and the civil rights struggle, the Vietnam War in Saigon, the Middle East conflict from Cairo, the Cold War with stints in both Moscow and Washington, and six American presidents and their administrations. In 1971, as chief diplomatic correspondent, he was a member of the Pulitzer Prize-winning team that produced the Pentagon Papers series. In 1974, he won the Pulitzer Prize for International Reporting from Russia and Eastern Europe. Smith has worked for PBS, produced dozens of prime time special reports, and won numerous awards. He is author of The Power Game and The Russians. City Club of Bellingham meets at Northwood Hall. Doors open at 11:15am, a buffet lunch is served at 11:50 a.m., the program starts at 12:20 p.m. and ends at 1:30 p.m. Lunch costs $13 for members and $18 for non-members when purchased in advance on Brown Paper Tickets; IMPORTANT NOTE: ADVANCE TICKET SALES CLOSE at 10:30am, Monday, July 22nd, 2013. A limited number of tickets may be available at the door at the cost of $15 for members and $20 for guests. Learn more about his event at bellinghamcityclub.org. This program is open to the public. Village Books will be selling Hedrick’s book at this event. Hedrick Smith -- "Who Stole the American Dream?" Hedrick Smith will speak about and sign his new book, Who Stole the American Dream?, on Wednesday, April 10th at 7:30pm. About the book: Pulitzer Prize winner Hedrick Smith’s new book is an excellent achievement, an eye-opening account of how, over the past four decades, the American Dream has been dismantled and we became two Americas. This book is essential reading for all of us who want to understand America today, or why average Americans are struggling to keep afloat. Who Stole the American Dream? is a magnificent work of history and reportage and is filled with penetrating insights, provocative discoveries, and the great empathy of a master journalist. Pulitzer Prize winner Hedrick Smith’s new book -- Who Stole the American Dream (Random House, $30) -- is an extraordinary achievement, an eye-opening account of how, over the past four decades, the American Dream has been dismantled and we became two Americas. Smith takes us across America to show how seismic changes, sparked by a sequence of landmark political and economic decisions, have transformed America. As only a veteran reporter can, Smith fits the puzzle together, starting with Lewis Powell’s provocative memo that triggered a political rebellion that dramatically altered the landscape of power from then until today. Smith reveals how pivotal laws and policies were altered while the public wasn’t looking, how Congress often ignores public opinion, why moderate politicians got shoved to the sidelines, and how Wall Street often wins politically by hiring over 1,400 former government officials as lobbyists. Hedrick SmithWho Stole the American Dream? Hedrick Smith promotes Who Stole the American Dream?. HEDRICK SMITH, WHO STOLE THE AMERICAN DREAM? CAN WE GET IT BACK? Pulitzer Prize-winner Hedrick Smith's new book is an extraordinary achievement, an eye-opening account of how, over the past four decades, we have become two Americas. In his bestselling The Russians, Smith took millions of readers inside the Soviet Union. In The Power Game, he took us inside the Beltway, to reveal how the game of politics and policy was played in Washington in the 1980s. Now Smith takes us inside America to show the hidden, long-term process of landmark legislative, electoral and corporate decisions that have transformed us from an era of middle class power and prosperity and effective bipartisan politics to a new era of partisan gridlock, unequal democracy and even more unequal economics that have unraveled the American Dream for millions of middle class families. As only a veteran reporter can, Smith delves into history and unearths the critical patterns of change – how the New Economy and the New Power Game have created "jobless recoveries" and the gaping inequalities between the 1% and the 99% and dismantled the engine of shared prosperity, the "virtuous circle of growth" in which companies paid workers high wages, the middle class spent its earnings, and robust consumer demand powered the next round of America's growth. Smith talks to everyone. He tells the stories of Americans high and low. From political leaders like Bill Clinton, Newt Gingrich, and Martin Luther King Jr., to CEOs such as Al Dunlap, Bob Galvin, and Andy Grove, to heartland Middle Americans such as airline mechanic Pat O’Neill, software systems manager Kristine Serrano, small businessman John Terboss, and sub-contractor Eliseo Guardado, Smith puts a human face on how middle class America and the American Dream have been undermined. This magnificent work of history and reportage is filled with the penetrating insights, provocative discoveries, and the great empathy of a master journalist. Finally, Smith offers ideas for restoring America's great promise and reclaiming the American Dream. Hedrick Smith, Pulitzer Prize-winning former New York Times reporter and editor and Emmy award-winning producer/correspondent, has established himself over the past 50 years of his career as one of America's most distinguished journalists. In 26 years with The New York Times, Smith covered Martin Luther King, Jr. and the civil rights struggle, the Vietnam War in Saigon, the Middle East conflict from Cairo, the Cold War with stints in both Moscow and Washington, and six American presidents and their administrations. In 1971, as chief diplomatic correspondent, he was a member of the Pulitzer Prize-winning team that produced the Pentagon Papers series. In 1974, he won the Pulitzer Prize for International Reporting from Russia and Eastern Europe. Smith has worked for PBS, produced dozens of prime time special reports, and won numerous awards. He is author of The Power Game and The Russians. Hedrick Smith is currently considered a "single author." If one or more works are by a distinct, homonymous authors, go ahead and split the author. Hedrick Smith is composed of 3 names. You can examine and separate out names.